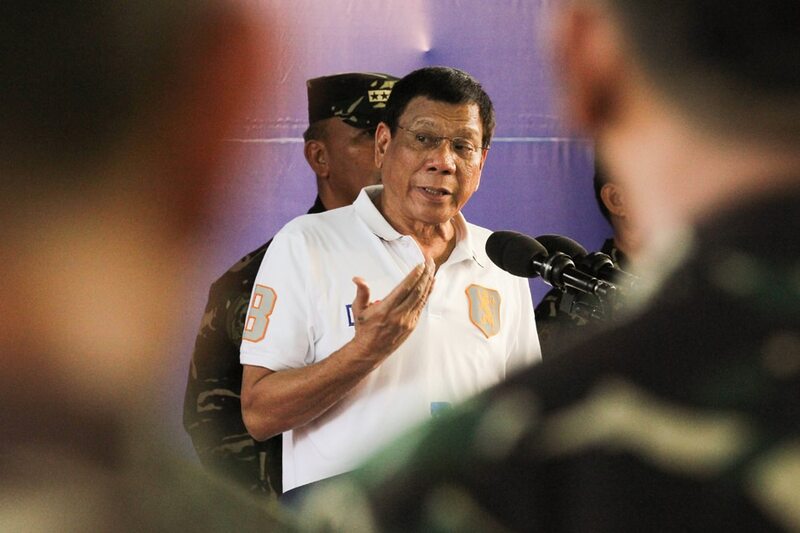 MANILA - President Rodrigo Duterte on Thursday took a swipe against foreign critics of the administration's war on drugs and said he would make them "human targets" for Filipino soldiers. This, as an International People's Tribunal found Duterte guilty of human rights violations, citing witness testimonies on alleged incidents. Speaking before soldiers, Duterte said he would only "bow to the Filipino people." "If I fell short, then as a Filipino, that is your right to criticize and even slam me if you want. I would never, never take it against you. Pero kung itong mga puti, itong mga g*** na ito, magpunta dito, maghanap ng kasalanan natin (These Caucasians, they go here to look for our faults)," Duterte said in a speech in Camp O’Donnel in Capas, Tarlac. "Hindi ko nga alam kung ano ‘yang extrajudicial killing. Eh wala ‘yan sa Revised Penal Code. Kaya sige lang, balang araw ‘pag naubusan kayo ng target at gusto ninyo ng live-fire pati live human target, makapagdala lang ako ng tatlo niyan, makita mo ‘yan eh puro puti," he said in jest. Presidential spokesman Harry Roque earlier said the public should not always take Duterte's words seriously. Duterte also welcomed White House National Security Advisor John Bolton’s attack on the International Criminal Court (ICC), where the President is facing complaints over alleged human rights violations. “It’s good that there is an international pressure sa ICC kasi binul-s**t sila ni Bolton. He’s really a very far-right diyan sa America. Gaya ni [US President Donald] Trump,” he said. In March, Duterte withdrew the Philippines’ ratification of the United Nations treaty that created the ICC.